Bottoms up! Enjoy your pint al fresco at one of these pubs with gorgeous outdoor spaces. A little cracker of a pub, 14th­ century, part­ thatched and two miles from the sea. Prop up the bar, bring the dogs, tuck into the fabulous food; head chef Kris Jury and his team are making a splash in remotest Devon, using fresh local produce. Formerly a brewhouse with three cottages, the pub stands in a sleepy village near Slapton Sands. Inside, find charmingly rustic dark ­beams and slate­ floors and outside, a beer garden with lush countryside views. Superior malt whiskies, Otter and Tribute ales, an extensive wine list to suit all pockets, and a homemade pie with a beautiful glaze on its puff pastry lid. They also have a children’s menu. A little cracker of a pub, 14th-century, part-thatched and two miles from the sea. Prop up the bar, bring the dogs, tuck into the fabulous food; head chef Kris Jury and his team are making a splash in remotest Devon, using fresh local produce, making seasonal changes to the menu. 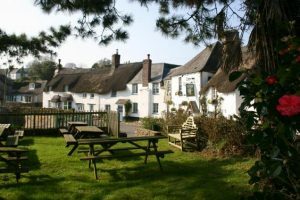 Formerly a brewhouse with three cottages, the pub stands in a sleepy village near Slapton Sands and takes its name from the tradesmen who trekked the coastal bridle path. Dark-beamed, slate-floored and charmingly rustic, the oldest part has a log-burner, antique tables and inviting bar stools, while the more hushed, more modern and slightly elevated dining room is red pattern-carpeted and dotted with gilt framed pictures. Outside: a beer garden with lush countryside views. Reasons to be here: superior malt whiskies, Otter and Tribute ales, top-notch breakfasts, an extensive wine list to suit all pockets, and a homemade pie with a beautiful glaze on its puff pastry lid. They also have a children’s menu, and do a great vegetarian option. Cathy and her husband have now introduced four bedrooms with super bathrooms upstairs, the two at the front the biggest and the best. Already posted complimentary comments on Facebook.